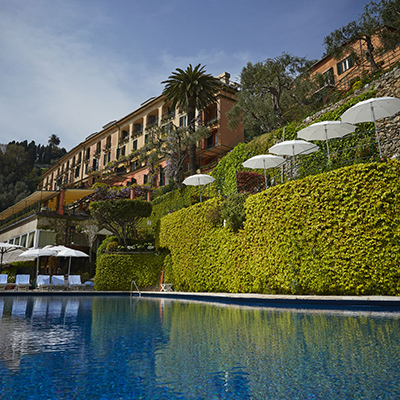 Belmond Hotel Splendido can be found in the picturesque village of Portofino in Italy. The hotel is an impressive sight, it’s tucked in hillside amongst luscious green trees and natural beauty, this wasn’t our first visit and we excited to be returning to this beautiful hotel. 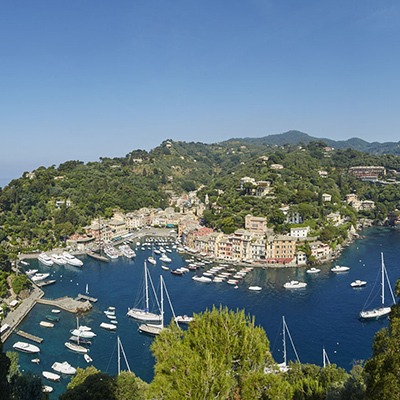 Portofino is a historic fishing village best known for its harbour and some impressive historical buildings. We certainly recommend exploring the local town as there are numerous beautiful and authentic bars, restaurants, and shops to discover. To do this you can either take a short and very pleasant walk down towards the town or jump on one of the complimentary shuttles Belmond run throughout the day. We experienced one of their Executive Suites during our stay. 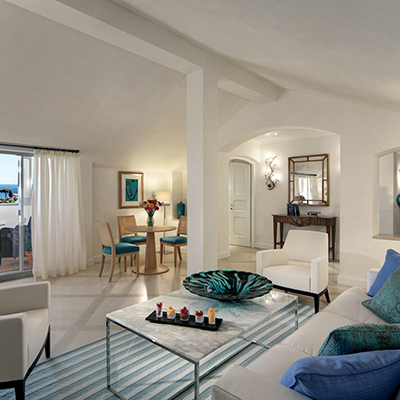 We were most impressed with the use of colour and the furnishings throughout the suite. The use of a crisp creme as a base, along with a wide range of subtle blues, greens, and shades of turquoise was most impressive. The main living area was spacious and was complete with a large flatscreen TV, a huge corner sofa with no shortage of cushions, coffee table, a small desk, and a fully stocked mini bar along with a small kitchen area compete with a coffee machine and a selection of coffee-pods. The living area also had its own balcony overlooking Portofino’s Cove, the wonderful views can be enjoyed first thing in the morning or as day turns to night we recommend enjoying this with a drink on a clear evening, it really is quite special. The bedroom is elegantly designed and is also home to a second balcony providing the same stunning views. The king size bed provided a peaceful night’s sleep, but the stand-out feature of the suite has to be the walk-in wardrobe. It’s no ordinary walk-in wardrobe, it actually pays homage to the Belmond Orient Express. The highly polished wood and finishing would be at home in a carriage on the Orient, and with no shortage of space and backlighting, we recommend unpacking and making use of the space, regardless how long you’re staying. 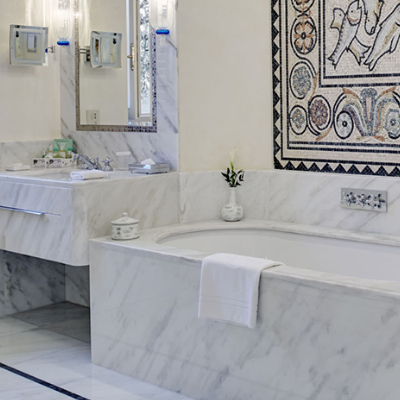 The bathroom is a room in its own right where the luxurious decor continues. From the tiled flooring, to the marble bath, his and hers wash basins, a large walk-in drench style shower, and even a thoughtful touch of a fresh elegant pink flower, it’s a small haven within a haven and a sets the scene for a most enjoyable soak. For dining, we recommend exploring the menu at La Terrazza restaurant, possibly after stopping at their cocktail bar for a drink beforehand. If relaxation is on your agenda then a visit to their Wellness Center is a must, here you’ll find a range of treatments guaranteed to rejuvenate mind and body. 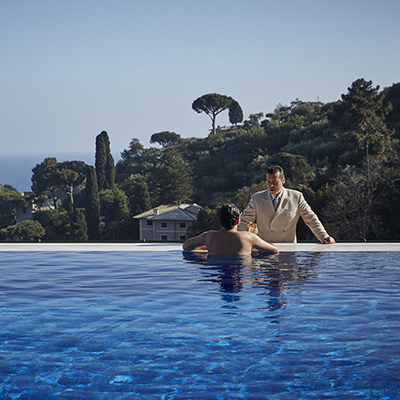 We cannot talk about this hotel without mentioning their swimming pool, it really is stunning, its huge heated infinity pool with unspoilt views over Portofino surrounded by sun loungers and chairs making this the perfect place to spend the afternoon relaxing in the sun. 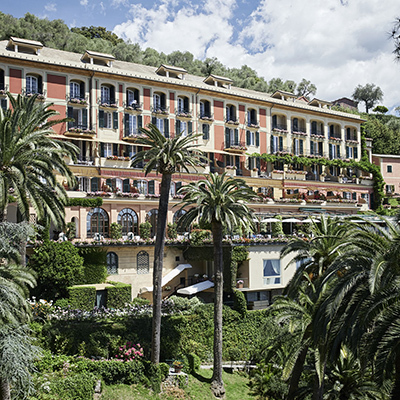 We thoroughly enjoyed our stay at Belmond Hotel Splendido. The staff were very friendly, they took care of our every need, and we cannot fault it and once again we left with fond memories and this still remains one of our personal favourite hotels.